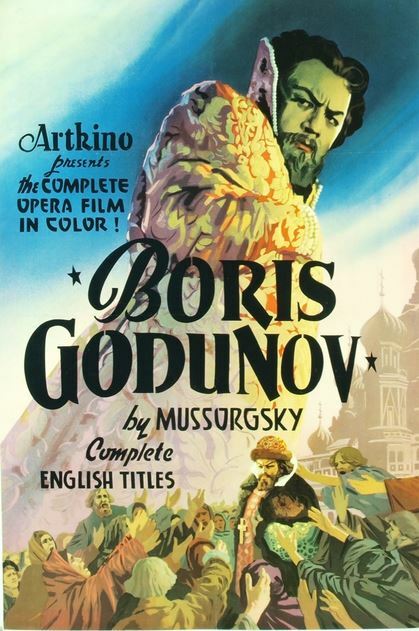 Lavish, 1954 Soviet film based on Mussorgsky's opera of the same name and which was referred to as a "national musical drama". The basis of the opera's plot was Pushkin's dramatic poem about Russia at the end of the 16th Century, when various candidates and adventurers fought for the tsarist throne. One of these is Boris Godunov, a man persecuted by the voice of his conscience for having once committed murder. Then there's the dramatic history of the young monk Grisky Otrepeva, who dreams of world glory. There's also the figure of Dimitry, the impostor, who, with the help of foreigners and the treacherous Russian nobility, attempts to pass himself off as the rightful Tsar. But of note is that the hero of the drama is not one from the common folk. The common people in this opera are oppressed and raped of their dignity. They realize that whoever is Tsar, he will be on the side of the rich and powerful. DVD-R is in Russian with hard-encoded English subtitles. Approx. 108 mins. Some softness and pixellization issues.